Sep - 21 | By: Tom McFadden | no comments. 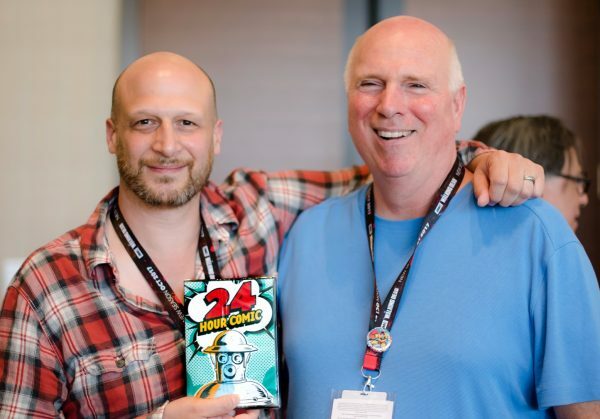 Cartoonist-stars Paul Guinan and David Chelsea join filmmaker Milan Erceg to celebrate 24 Hour Comic screening at San Diego Comic-Con International Independent Film Festival. 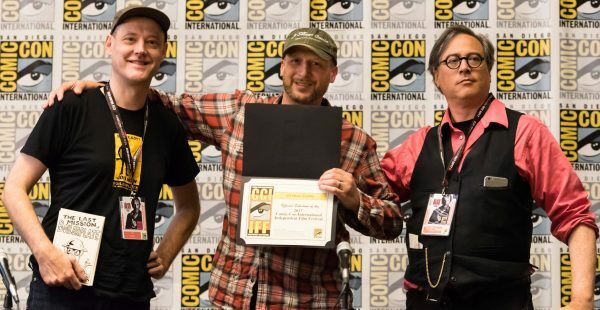 The biggest little indie feature doc in Oregon, 24 Hour Comic, screened at the San Diego Comic-Con International Independent Film Festival this July. Director Milan Erceg, whose film documents a marathon of comic book creation, says the recognition from Comic-Con film festival “is about the biggest honor we could have.” Comic-Con founder Mike Towry, who attended the screening, said he found 24 Hour Comic “interesting and entertaining.” Nat Gertler, who launched the first 24-hour comic day in 2004 which ultimately inspired Erceg’s movie, also joined 24 Hour Comic filmmakers and cast members in San Diego to celebrate the film’s acceptance at one of the world’s most important pop culture festivals. “We never would have guessed this little documentary would have the response and opportunities that it has had” says Erceg. Mike Towry, San Diego Comic-Con founder, and director Milan Erceg.